Super League players Rhys Evans and Ben Flower will be unavailable for Wales’ 2017 Rugby League World Cup Qualifiers. 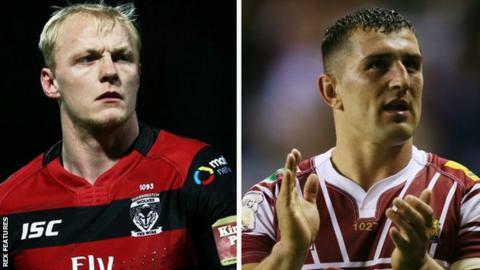 Warrington Wolves’ Evans and Flower of Wigan Warriors will be in action in Saturday’s Grand Final at Old Trafford. Both players had been named in an initial 29-man training squad, but have made themselves unavailable due to club commitments. Wales will also be without Tyson Frizell, who has been included in Australia’s Four Nations squad. Salford Red Devils’ Craig Kopczak will captain a squad featuring the majority of last year’s European Championships winning side. Wales host Serbia at Stebonheath Park’s Llanelli on 15 October and and face Italy in Monza on 29 October. “It is an important period for Wales as we aim to make the World Cup next season,” head coach John Kear said. Kear has said he would be happy for second row Frizell to represent Wales once again in the future. Frizell, capped five times by Wales, has been included in Australia’s squad for the Four Nations. Australian-born Frizell qualifies to play for Wales through his Swansea-born father and can switch to the Kangaroos as they are a tier one nation. “There’s no hard feelings,” Kear told BBC Wales Sport.